AccuStage Overview - NexSens Technology Inc. 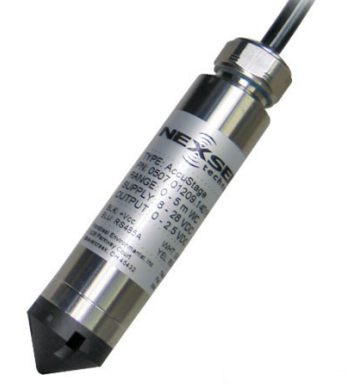 The NexSens AccuStage water level sensor is a completely self-contained pressure transducer. Both water level and temperature readings are available on the RS-485 Modbus output. Additionally, water level is available on the 0-2.5VDC analog output. The AccuStage is available in vented or absolute configurations and is ideally suited for long-term environmental monitoring applications in surface water, streams and reservoirs. This device is also perfect for measuring water level in weirs, flumes, or irrigation channels to compute flow. Additionally it can be used with NexSens iChart software and an iSIC or SDL data logger to measure significant wave height, dominant wave period, and level for tide gauge systems.